Neck pain, along with lower back pain, is an extremely common condition and reason that people pay a visit to their doctor. Most cases of neck pain can be attributed to problems that lie within the musculoskeletal system, which includes the bones of the spine (the vertebrae), and the soft tissues (the muscles and ligaments) that give the spine necessary support. The flexibility of your neck can be a double-edged sword – it is needed in order to accommodate the broad range of motion of our head, but it leaves it particularly susceptible to injuries and wear and tear. The neck, frequently referred to as the cervical spine, contains seven vertebrae. Most are very similar and are separated by an intervertebral disc made up of cartilage that surrounds an inner nucleus made up of a jelly-like substance. The uppermost vertebrae in the neck, the atlas (C1) and axis (C2) are unique because they bear the weight of the head above and are responsible for the majority of its movement. Through a canal that runs through the center of the vertebrae passes the brainstem as it exits from the base of the skull and the spinal cord. From the spinal cord branch nerve roots that emerge from between the vertebrae that connect with nerves throughout the body that control movement and sensation. To tie everything together, the neck has multiple muscles and ligaments to give it support. 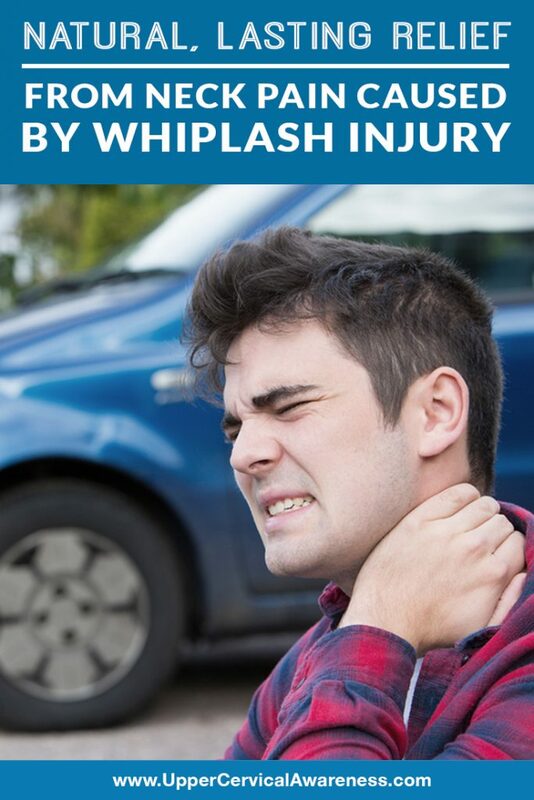 When the neck is forced into rapid flexion and extension and any of the abovementioned tissues are damaged, it is referred to as a whiplash injury. Neck pain that occurs due to whiplash injury can linger for months or even years beyond when the initial event occurred. As you can see, the effects of whiplash extend far past simple neck pain and can cause a major disruption in a person’s ability to perform basic daily tasks like shampooing their hair, tying their shoes, or driving a car. Is Lasting Neck Pain Relief Possible? Many whiplash sufferers will suffer from chronic neck pain and other associated and long-lasting complications as a result of their injury. Treatment for individuals suffering from the effects of whiplash usually includes a combination of pain medications, anti-inflammatories, muscle relaxants, and even anti-depressants. The neck might be immobilized in a cervical collar for a period of time following the injury. Despite all of the best common treatment protocols, the reality is that neck pain, stiffness, and other whiplash symptoms may persist because the underlying injury to the spine was never corrected. When the head, which weighs an average of 12-13 pounds in an average adult, snaps back and forth and damages the tissues of the neck it leads to a misalignment of the atlas, the vertebra that forms a junction between the neck and skull. Malposition of the atlas vertebra can have a devastating and long-lasting impact on your body’s ability to recover following a whiplash injury. When the atlas misaligns, it disrupts normal neurological function, blood flow, and cerebrospinal fluid (CSF) flow. These three factors play a critical role in the body’s ability to repair damage. If tissues are not receiving normal neurological communication or oxygenated blood, their ability to heal and function properly is diminished. Practitioners take the time to understand the history of your injury and perform a thorough analysis. Low-force adjustments that are customized for each patient – upper cervical chiropractic care is NOT a one size fits all approach and doesn’t require any forceful popping or twisting of the neck. Precise adjustments are designed to hold in place for longer, giving your body the time it needs to heal naturally. If you have been living with the after-effects of a whiplash injury or any other cause of chronic neck pain, find an upper cervical chiropractor near you and schedule a consultation so that your ongoing pain can become a thing of the past.